In the South of France, vacation dreams come true. The same holds for Marina Baie Des Anges, a contemporary resort complex offering access to dazzling beaches and classic European attractions. 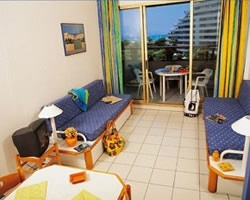 Find Marina Baie des Anges timeshares today and save thousands! 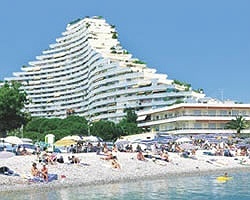 What’s My Marina Baie des Anges Timeshare Worth? Built on the shores of the stunning Mediterranean coast in the South of France, Marina Baie des Anges dazzles the Villeneuve-Loubet skyline with a contemporary structure you cannot miss. Home to individual apartments, vacations at the Marina Baie des Anges are never in short supply. A Marina Baie des Anges timeshare can help you explore the beautiful destinations of Cannes, Nice, and others any year you choose to visit. Complete with spectacular ocean views and unbeatable proximity to attractions, you'll be proud to call the legendary building your home-away-from-home. 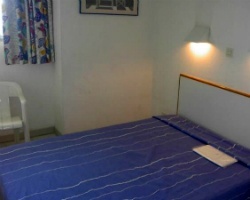 With up-to-date features and accommodations, the Marina Baie des Anges apartments will delight any traveler visiting the French Riviera. Homelike suites line the entire complex and include full kitchens, private balconies, contemporary entertainment systems, multiple sleeping areas, and more. On-site, you'll find direct access to the marina and nearby beach, as well as convenient transportation to the city of Nice or the subtropical paradise of Antibes. With so many opportunities to own a unit at this resort while saving money, you can get started on your path to luxury, cost-efficient vacations today. Fill out the form on this page to learn more, or call a representative at 1-877-815-4227. Owning a timeshare resale at the Marina Baie des Anges will give you access to all of the great sights and locales of the French Riviera every year while saving you thousands of dollars off retail costs. The secret is in the secondary market—timeshare resales are sold by owners, not by resorts or developers. Because of this, ownership options are available at much more realistic costs, allowing you to save up to 70% off retail pricing. What's more, you'll have an array of exciting vacation benefits you wouldn't normally have elsewhere. For instance, you can find immediate access to the yacht marina outside, the sands of Plage de la Batterie nearby, and plenty more. As a timeshare owner at the Marina Baie des Anges France, you may be able to exchange your accommodations through RCI or Interval International. Exchanging your timeshare allows you to forego your yearly stay at your resort and opt instead for an alternative getaway in another destination. All you need is a separate, affordable membership to get started, and you can begin browsing properties in unique destinations worldwide. Opt for a vacation in the Alps during winter, or visit Spain and the Costa del Sol region—the choice is yours! Enjoy an outdoor pool on-site at the resort, as well as laundry facilities and sweeping ocean views. The beach is just outside the building's front door, as well as a large marina where you can see a variety of luxury yachts docked. Find essentials like gyms, grocery stores, and restaurants along nearby Route 7, or spend a day at Marineland, just a few minutes to the south. Villenueve-Loubet is positioned between the cities of Nice and Antibes, offering a variety of places to explore during your stay. Browse classic works of art at Musee Matisse, or walk the Promenade des Anglais for a leisurely summer activity. 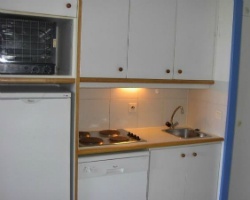 Already Own at Marina Baie des Anges?